Are you spending too much money on traffic? 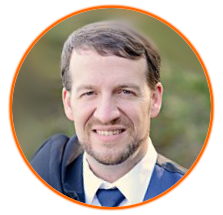 Is it fun to spend your limited marketing resources on tons of leads that don't intend to buy from you? 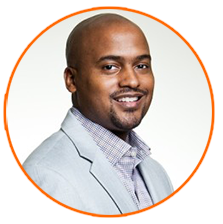 Wouldn't it be better to get more high quality traffic organically - without spending a single dime? 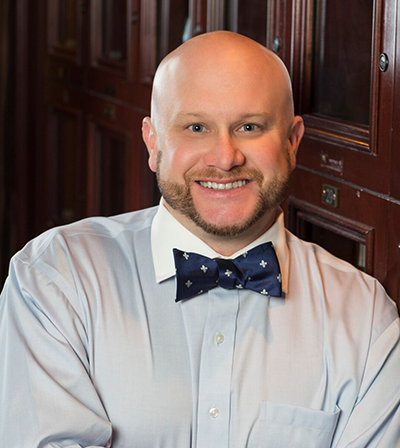 It's hard to strike the perfect balance between traffic you pay for up front, traffic you get from long-term preparation, and traffic you get from referral partners. Hi, I'm Lee. And I'm in business to do ONE thing: serve you. And that means I can show you how to strike that perfect balance. ACCUMULATE HIGH QUALITY TRAFFIC WISELY? 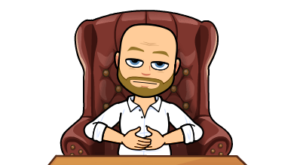 Let me first caution you about falling into the trap of thinking that more traffic means more business for your agency. This is NOT the case. When it comes to traffic, it’s about quality over quantity. 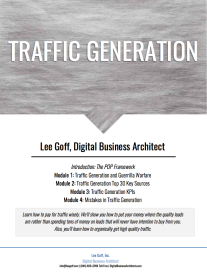 In our Traffic Generation Agency Blueprint course, we explain the P.O.P. 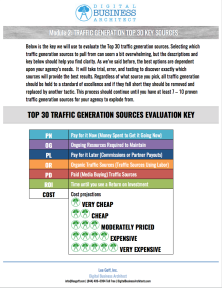 framework (pay now traffic, ongoing effort traffic, and pay later traffic), Guerrilla marketing warfare, the Top 30 traffic generation sources, the KPIs you need to evaluate those sources, and to wrap up, we will warn you of some common mistakes agencies make as it pertains to Traffic Generation. 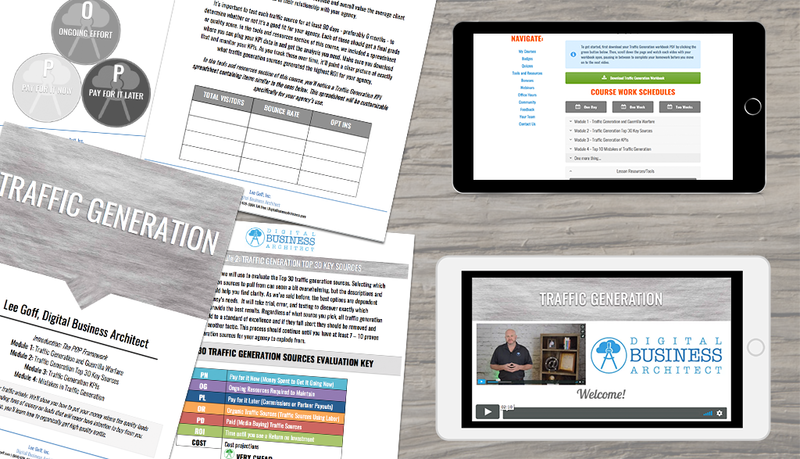 Armed with all of this knowledge, you’ll be ready to create a traffic generation strategy for your agency and become a traffic generation master! Regardless of how you get traffic, all traffic generation follows our P.O.P. framework. 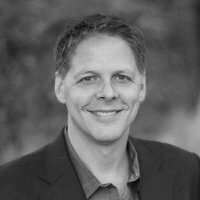 Ultimately, there are three different types of traffic your agency will need to have in its arsenal to create the explosive growth we all desire. Pay Now traffic is normally expensive up front, but it’s required to build a sustainable and fast-growing agency. (Google Adwords, Facebook ads, etc). Ongoing Effort traffic refers to organic SEO, content marketing, blogging, and so on. 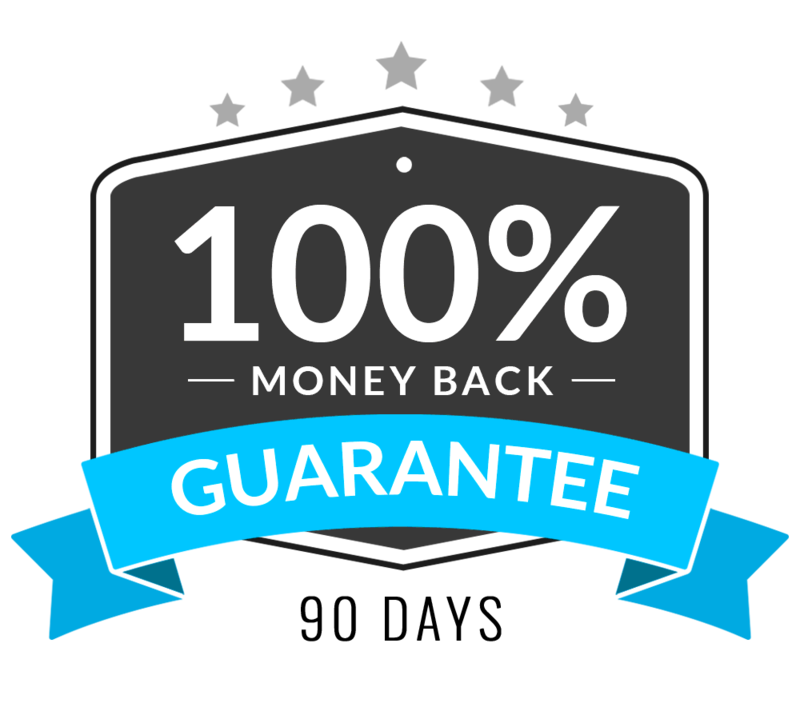 Pay Later traffic refers to joint ventures, affiliates, referral partners, or co-promotional events. EACH piece of the p.o.p. framework. It's all about balance. Too much Pay Now traffic will eat through your cash faster than you would think... not to mention if your target audience isn't dialed in as much as it could be. Relying too heavily on Ongoing Effort and Pay Later could also make your lead flow unpredictable. Organic SEO and referral partners are no doubt "must haves," but you have to also be able to turn on the leads like a water faucet - which is where Pay Now traffic comes in. BE ABLE TO TURN ON TRAFFIC LIKE A WATER FAUCET. 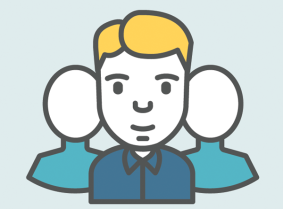 Have you seen people effectively using Facebook groups for traffic and leads? Now you can too. Facebook Ads? Facebook Remarketing Pixels? Messenger? Organic? All topics for you to learn in our Traffic Generation online course. In addition, we touch on traffic generation on other social media accounts such as LinkedIn, Instagram, Snapchat, and more. USE GUERRILLA TACTICS TO GET WARM TRAFFIC. There are plenty of different ways to get in front of your audiences - ways your competitors have never thought of before. Learn how to be bold and different with your marketing strategies and get your name out there to people who wouldn't have heard of you otherwise. LEVERAGE HIGH VALUE CONTENT TO GET HIGH VALUE LEADS. Creating and syndicating content that your prospects find valuable is the best way to drive traffic to your site and get more opt-ins to your lead magnets. In this course, learn how to use your content over time to draw in traffic that is ready to buy. 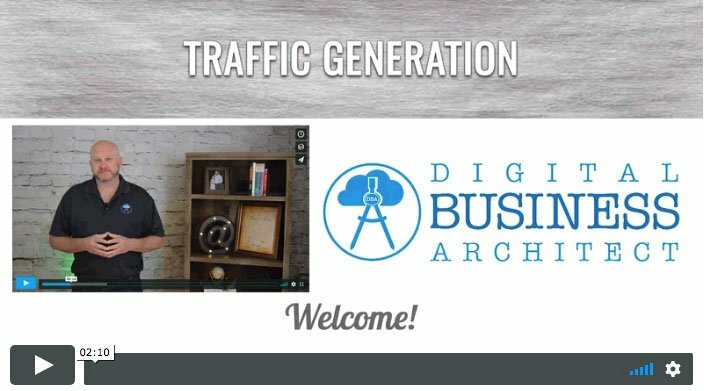 Get access to our Traffic Generation online training course by clicking the button below. Your course comes with a DBA online membership, comprehensive lecture videos, a detailed workbook, immediately applicable tools and resources, and so much more. Enjoy having a simple, consistent lead-flow machine. No more scrambling for a lead!!! Work toward shaping a REAL business that provides ongoing income for you and your family. Continue to waste time scrambling for traffic and leads due to an imbalance in your P.O.P. Framework. Consistent stress and anxiety over inconsistency and lack of predictability in profits from month to month. I want to start getting consistent and predictable traffic now!